And the President's car following close behind came along at an average speed of 10 or 15 miles an hour. It wasn't that much, because they were getting ready to turn. And the driver of the Presidential car swung out too far to the right, and he came almost within an inch of running into this little abutment here, between Elm and the Parkway. And he slowed down perceptibly and pulled back to the left to get over into the middle lane of the parkway. Not being familiar with the street, he came too far out this way when he made his turn. Mr. BELIN. 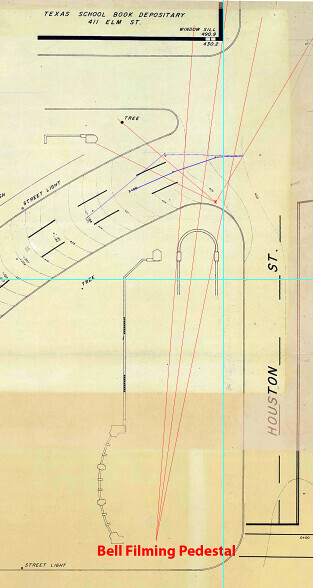 He came too far to the north before he made his curve, and as he curved--as he made his left turn from Houston onto the street leading to the expressway, he almost hit this north curb? Mr. TRULY. That is right. Just before he got to it, he had to almost stop, to pull over to the left. If he had maintained his speed, he would probably have hit this little section here. So Chris... the 33 frames are for both the time and Distance? Since your white limo path is what it "appears" to be while my black limo is more suggestive of what actually happened..
Mr. SPECTER. 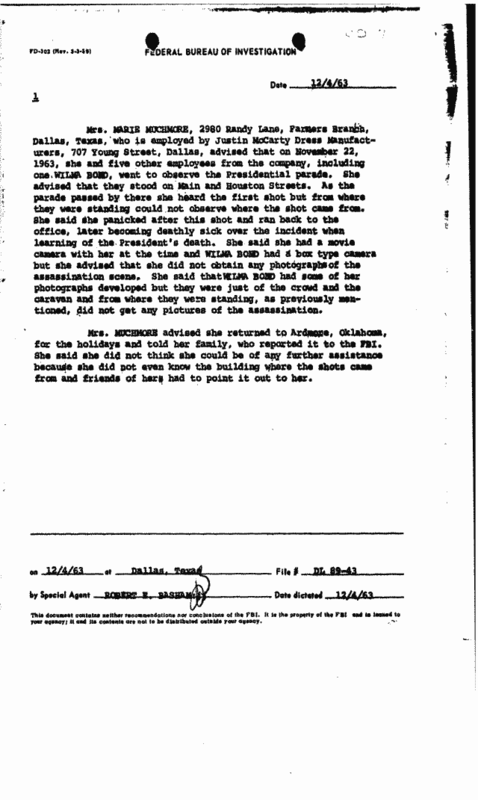 When you say that position A is the first position at which President Kennedy was in view of the marksman from the southeast window on the sixth floor of the School Book Depository Building, you mean by that the first position where the marksman saw the rear of the President's stand-in? To recap... at a spot that is all but impossible to pass thru unless TRULY's account is correct, is the location from where a marksman could FIRST hit a spot on the back of the POTUS stand-in. 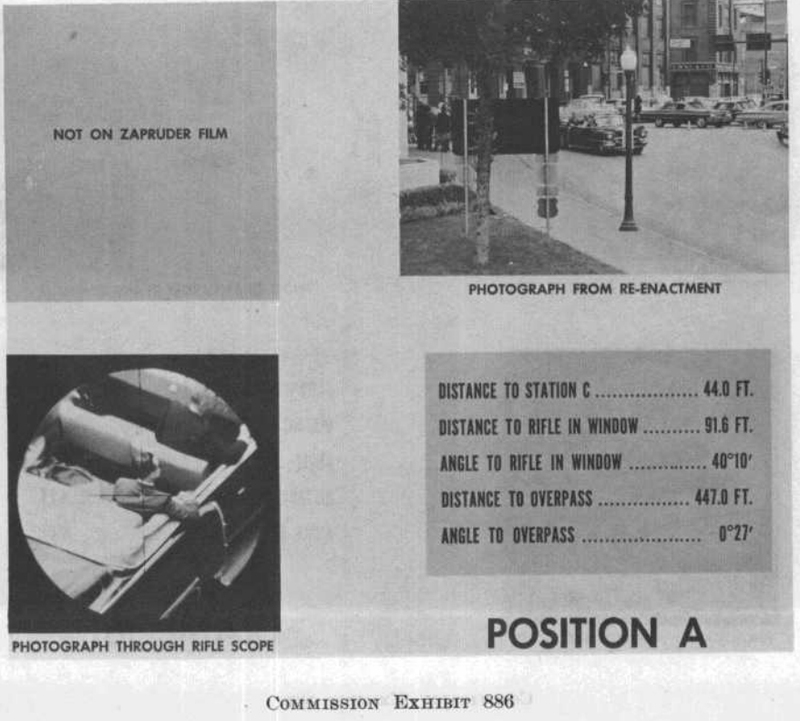 To place a crosshair at that spot on JFK he'd need to be 10" lower in elevation which means he was 15.25 feet further down Elm than what we see in the photo at the top right. Mr. SHANEYFELT. Yes. 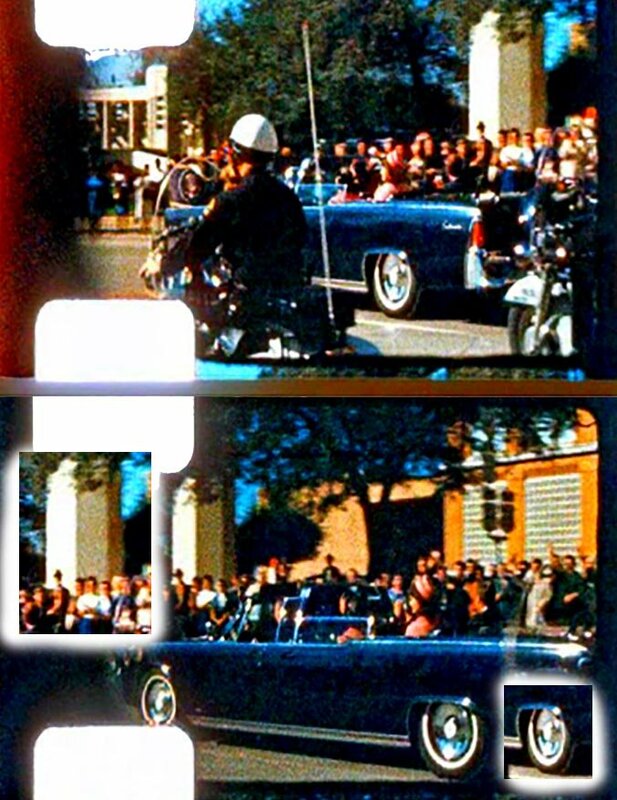 Since it was not practical to stop the projector when using the original of the Zapruder film, because of the possibility of damage to the film, Mr. Orth volunteered to prepare 35-mm. color slides directly from the original movie of all of the pertinent frames of the assassination which were determined to be frames 171 through 434. Mr. SPECTER. What other movies have been examined by you in the course of this analysis? Mr. SPECTER. Did you analyze any other film in connection with this inquiry? Mr. SHANEYFELT. Yes. I analyzed a film that was 8-mm. motion picture film taken by Mrs. Mary Muchmore of Dallas, Tex. Mr. SPECTER. I now hand you an album which has been marked as Commission Exhibit No. 885. Mr. SPECTER. I ask you to state what that album depicts. Mr. SPECTER. Starting with what frame number? Mr. SHANEYFELT. Starting with frame 171, going through frame 334. Mr. SPECTER. And why did you start with frame 171? Mr. SHANEYFELT. This is the frame that the slides start from. This was an arbitrary frame number that was decided on as being far enough back to include the area that we wanted to study. Mr. SHANEYFELT. The first position we established that morning was frame 161. Mr. SHANEYFELT. Life magazine was reluctant to release the original because of the value. So he brought it down personally and projected it for us and allowed us to run through it several times, studying the original. Mr. SPECTER. Was that because the copies were not distinct on certain important particulars? Mr. SHANEYFELT. That is correct. The original had considerably more detail and more there to study than any of the copies, since in the photographic process each time you copy you lose some detail. Mr. SPECTER. And subsequently, were slides made from the original of the Zapruder film? 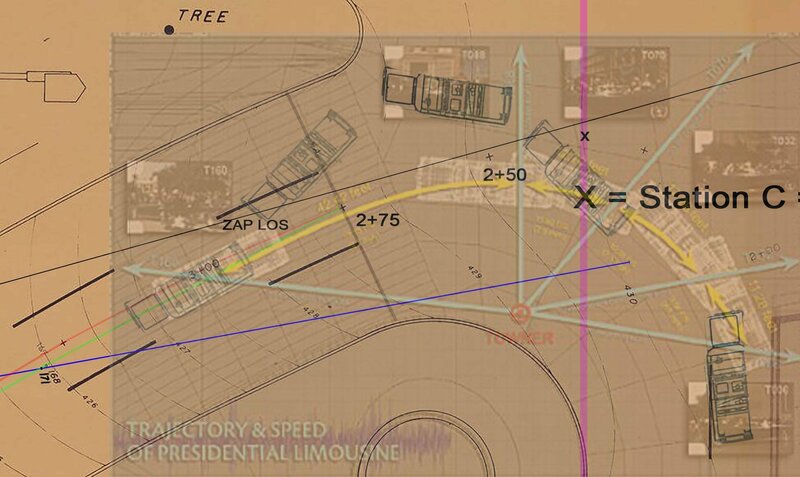 If I put JFK where Position A is designated, the lane stripe is blocked by the limo. This is the only way it works. It matches, using Robert West's designated path. My filming location for Towner. Greer in alignment with the concrete structure. JFK in alignment with the tree. Reenactment similar to previous posting. I hear you buddy... yet from the reread it is obvious that this analysis assumes the limo and JFK passes thru POSITION A and is then at 133 with the Queen Mary directly behind it. Not sure why Truly is the only one to mention it yet we see no one really asking about it either. But let's make the assumption that JFK passes thru POS A - how do we explain these frames? She would be in the LOS of the rightside blue line and off the curb a few feet. 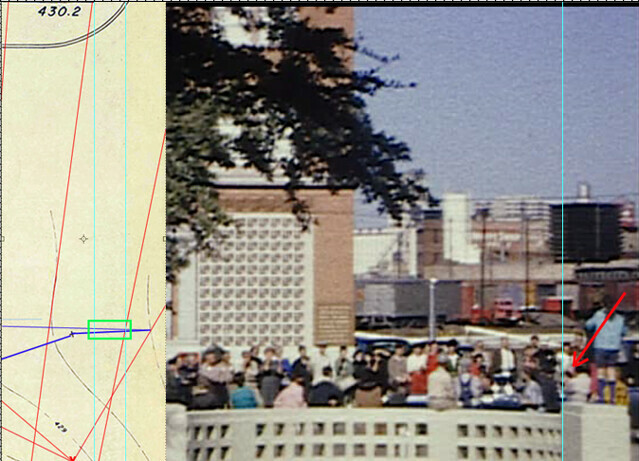 This is the closest I can find from Towner's view via the cameraman, with the Z pedestal and the curved curb included. Towards the end of her film, someone appears in the sprocket hole area. I would assume it is her father since he has a camera in hand. The gentleman with the pink shirt and white pants. Watch as someone pokes their head around his left side and then pulls back. You can barely see him until he moves. He is much taller than Tina Towner. She is off the curb, in the street making her even shorter than those in front, who are on the sidewalk. That is approx where Tina Towner is. Accommodate the (Towner end- z133 beginning )distance span with path change. End at extant z166 = Shaneyfelt (not Robert West) path via extant zfilm. StationC + 100 + 33 + 33 = 166frames. 11.28ft/26frames = .4338...ft per frame x 6 frames = 2.6ft + 83.68ft = 86.28ft total for Towner film. The plotting of JFK using Robert West's path for the Towner film = 110.90ft approx. Marc Bell's footage from the pedestal allows us to compare an overlapping area within the Towner film. Remember, no matter who is filming with what camera, the limo is traveling the same speed. The Towner LOS from StationC to the Tree = 38.685ft @ 60frames = .644..ft per frame. This creates a ratio of frames to frames over the same distance using two different frame rates. Since Myers used a phony frame rate of 22.8fps for Towner, it is more than likely, the ratio between that and the real Towner frame rate (+/- 1 frame) would hold true for Towner and Bell also. A real frame rate of 18.3 for Towner vs 22.8 yields the 33 frame difference over 167 Towner frames (previously shown). 60/48.08(+/- 1 frame) = 1.2479... x 18.3 = 22.83fps = Myers bogus rate. The car labeled "Bell limo" replicates the location of the limo in the frame grab below it... from BELL the corner of the TSBD opening is in line with that concrete opening. Just trying to see how it actually happened... take a close look at TOWNER again.... the FLV file you posted. Chris... the limo gets smaller as it moves away - at the same time the background gets bigger? o Chris... the 33 frames are for both the time and Distance? Someday I hope this thread can be presented - maybe even as a video - and titled Math Rules for Dummies. I'd sign up. There is a TSBD corner overlap between Bell/Towner. 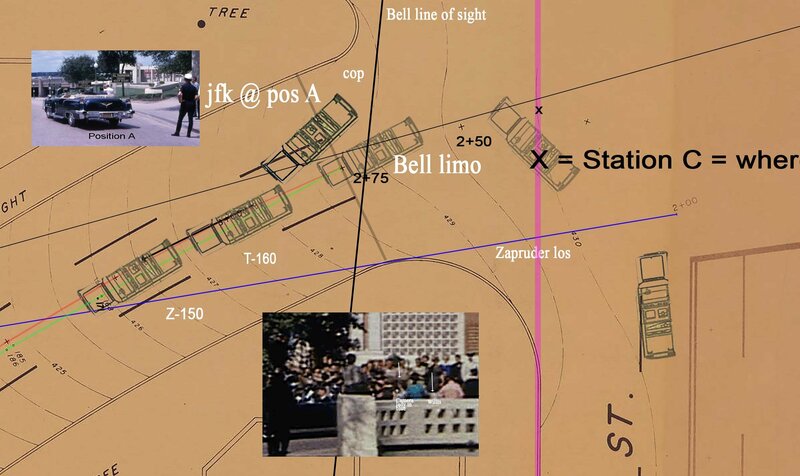 The graphic shows Bell's LOS using JFK's position within the limo. At this spot, JFK is approx 6.1ft (green box) from TSBD corner alignment. 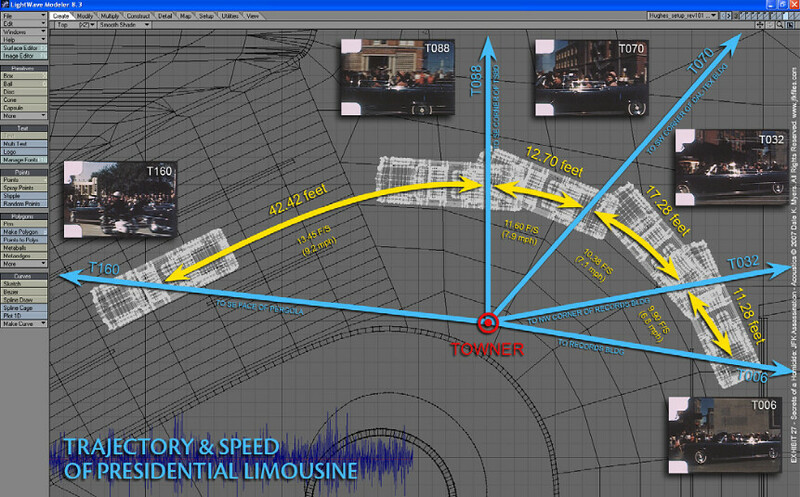 The speed of the limo is 23.75ft/29frames (plotted average from Dal-Tex to TSBD corner) = .818ft per frame. 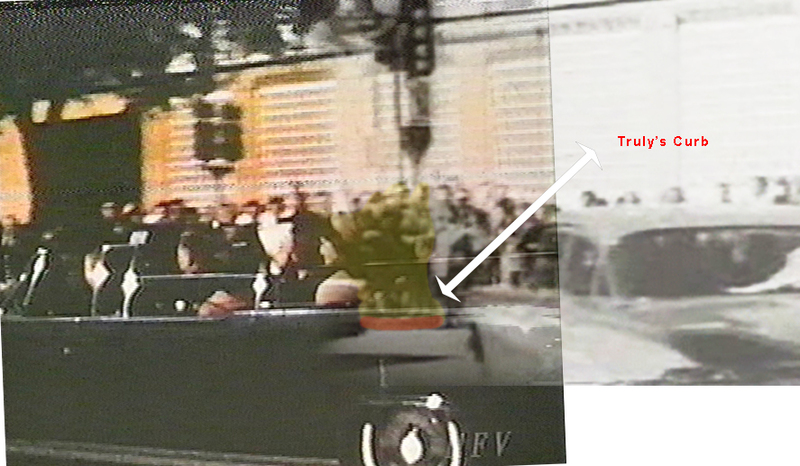 There are 6 previous Bell frames leading up to JFK's position in the graphic. 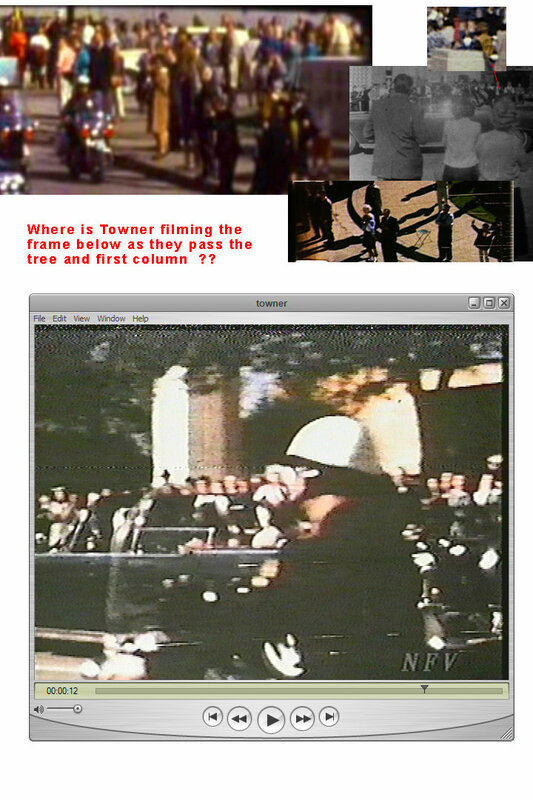 Bell's footage starts approx 13.45 Bell frames before JFK aligns with the TSBD corner.